The Awa'awa'puhi Trail is yet another Kokee trail which promises sweeping views and a trek through dense jungles and dry landscapes. Even though this trail is fairly even, we recommend sturdy hiking boots since it gets quite slippery when it has been raining. Awa'awa'puhi gets off to a slow start but picks up steam about halfway. The beginning of the trail is a relatively mellow stroll through the high forest. It is a peaceful hike. You'll see a series of marked plants along the trail and if you pick up the "Awa'awa'puhi Botanical Trail Guide" at the Kokee Museum it will guide you through the maze of native and introduced plants. The trail starts at approximately 4,120 feet and ends at the lookout around 2,500 feet. Hiking out, you'll no doubt respect each and every foot of that; especially if you're concluding this hike as a part of the Nualolo Trail / Nualolo Cliff Trail "loop." You can view the loop trail by opening Google Earth and viewing our Nualolo and Awaawapuhi Loop Trail map. Please Note: Due to erosion, Nu'alolo Cliff Trail is occasionally closed near the junction with Nu'alolo Trial. After the first mile the forest begins to dissipate, only making guest appearances once in awhile as the barren terrain of NaPali comes into view. You get your first glimpse of the Awa'awa'puhi Valley at about 1.75 miles. Use caution and do not go too close to the edge as some of the viewpoints are eroded. Marvel at the views of the sea as you approach the junction with the Nualolo Cliff Trail. You may run into a few fellow hikers on your way, as mountain goats like to cling to the steep slopes. Continue straight ahead (to your right) to the end of the trail and a spectacular view from your 2,500-foot perch. Weather permitting, you should get a breathtaking view of the lusciously green Awa'awa'puhi valley and Nualolo Aina Valley. Perhaps it is the view of the folding spires of NaPali that makes this trail so exceptional. Once you reach the end we recommend that you DO NOT venture beyond the railing, since there are precipitous drops on both sides and the ground can be deceptively slippery even when dry, as the small red rock scree erodes easily. For a nice day hike, you can backtrack to the Nualolo junction and continue along the Nualolo Cliff Trail to the Nualolo Trail which ends at the Kokee State Park headquarters. However, if you plan to hike that loop, we recommend you hike down Nualolo and back up Awa'awapuhi. You can read more about the "loop" on our Nualolo Trail entry. Don't forget to check our Kokee State Park Hiking page for information on all the incredible trails inside the park. On that page, we've also posted a map of the entire area (Kokee and Waimea State Parks) for you to download and print out at home. The Koke'e Lodge and Museum will also have maps available, but we'd definitely advise you to go ahead and review the map and become familiar with the area. The crisscrossing of trails and 4x4 roads can be confusing at first, but once you select your routes, it's not too bad. The Garden Isle truly is a marvel of Mother Nature... there are so many sights to see, trails to hike, and adventures to be had. 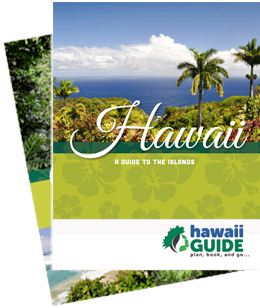 Here at GuideofUS- Hawaii, we have explored on our own and with some of the best-guided tours available. And trust us when we say that with a guided tour, you get to see and experience things in a way you simply cannot do independently. Here are some of our favorite Kauai guided tours, as well as helpful maps to get you oriented. Enjoy!